My mom and I share clothes. Well, if we are being honest, I steal her clothes. We have very similar taste and gravitate toward the same stores and styles. She is a few inches shorter than me, leaving most pants off limits, but tops and dresses are fair game. I was one of the lucky girls who actually liked the clothes that my mother bought me for my birthday. I never imagined that shopping for her "mother of the bride" dress would be such a challenge. What is with all the jackets? For a fancy event, Mom might grab a cardigan or wrap to keep herself warm at night. The matching jacket is kind of a conservative move. It definitely works for some women and it sometimes adds a little style to the ensemble. I get this look- although maybe not in that color! My mom, however, is not a dress and jacket kind of lady. We wanted something flattering and fun. Something cocktail length, nothing strapless, nothing too short or low cut and no black (mom's decision). She also didn't want to spend more than a few hundred dollars. This is what we found. All are lovely, but none were suited to my mom. A little too country club, not enough 50's dance hall. We did most of our research online and bought a few/returned a few. Next time, I can show you the dress and her runner-up. I really like the blue one from Nordstroms. I always have that luck, I have such a hard time finding a dress that fits a theme when I need it. You always find it when you're not looking specifically for it. Sorry for the random post...I linked from brokass bride... but I needed two mother of the bride dresses in one summer! They all seem to be designed for 70 year old ladies. I ended up finding a dress at Nordstrom that i loved! Loved the fit and style, hated the color. 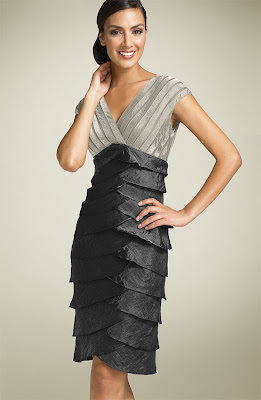 I took it to a dress maker and she created a pattern from the dress and made it in a beautiful copper dupioni silk. i returned the original and all was well! Just a suggestion if you get stuck! ahh the M.O.B. dress... my mom is just now starting to think about hers. I'm with Tina - the blue Nordstroms is tres chic! But I have been to a wedding before where the M.O.G. LITERALLY wore a long white gown. Sheesh, what a drama queen. I love the navy number about halfway down. The neckline is what my mother wore to my big day and photographed beautifully! Beautiful out fit for wedding. I'll recommend this style to my friend. Thanks! i think the blue is beatiful and suitable. Your blog is so informative, I'm looking forward to reading future posts! Love the dresses, I picked out the second one for my mother-in-law actually...had she not asked me to pick there is no telling what she would have worn haha. Hey really very nice collection. 'Blue' i liked most.